Neato Botvac series vacuuming robots represent the latest generation of Neato robots, with the most popular being Botvac Connected, Botvac D3 Connected, Botvac D4 Connected, Botvac D5 Connected, Botvac D6 Connected, Botvac Connected D7 and Botvac D80. Note that Botvac D7 Connected is Neato's top robot. If you have decided to acquire a Neato vacuuming robot, but you are undecided about which model to get, you will find this article useful. Botvac robots have larger brushes, and except for Botvac D3 Connected, all Botvac robots are equipped with a side brush, while there was no side brush on the XV series robots. They have larger dirt bins than the previous XV series robots, meaning that you don't have to empty the bin as often. Some Botvac robots are equipped with ultra high-performance filters that capture twice the amount of allergens and dust captured by the filters found on the XV series robots. They are less noisy than the XV series robots. Some Botvac robots are equipped with Lithium-Ion batteries, while XV series robots had Ni-MH batteries. Lithium-Ion batteries last longer before needing to be replaced and they provide longer run-times. Most Botvac robots support Wi-Fi and can be controlled from your smartphone or tablet. Neato Botvac Series Robots on Amazon. Botvac Connected, D3 Connected, D4 Connected, D5 Connected, D6 Connected and D7 Connected robots support Wi-Fi and can be controlled from your smartphone or tablet using the associated Neato App. You can use the Neato App for operations such as starting, stopping, scheduling the robot, spot cleaning and receiving notifications about your cleaning sessions. The Neato App is offered free both for Android and iOS devices. Note that Botvac D7 Connected supports both 2.4 GHz and 5.0 GHz Wi-Fi. Neato robots clean all floor types by automatically transitioning from one floor type to another, whether vacuuming on carpet or bare floors such as hardwood, tile or vinyl. With the LaserSmart technology, all Neato robots are equipped with a laser eye that uses infrared light to scan the surroundings to build an accurate map of the room and any obstacles therein. Using this map, the robot can efficiently clean the floor in a pattern of straight and overlapping lines, avoiding obstacles and stairs, and never missing a spot. This method used by Neato robots makes sure that the entire floor surface is covered. Under normal operation, the robot will come off its base, will scan the surroundings to build a map of the room considering any obstacles and stairs that may be in the room, and will start cleaning in sections approximately 15 ft. by 15 ft., depending on room layout and furniture placement. It will continue to clean section by section until the entire area is cleaned. Normally, the robot will try to clean each room fully before moving on to the next. If a room is only partially cleaned before the robot needs to go to recharge itself, it will come back after recharging to resume the job where it was interrupted (2 auto-recharges per cleaning cycle session). At this time, Turbo and Eco cleaning modes are exclusive to Botvac Connected, Botvac D4 Connected, Botvac D6 Connected and Botvac D7 Connected: Eco mode provides a quieter, longer energy saving cleaning, while Turbo mode delivers a super-powered cleaning with maximum pickup. Neato robots can have four types of brushes: a blade brush, a combo brush, a spiral combo brush and a side brush. - The blade brush offers superior cleaning performance across different types of floor surfaces and on bare floors. The blade, combined with Neato's powerful vacuum suction, remove easily debris, dirt and fibers. Note that the blade brushes that come with Botvac Connected and Botvac D80 are spiral rather than straight. The spiral blade brush works even more efficiently with all type of floors. - The combo brush combines the cleaning power of blades and bristles and offers superior pickup of pet hair. It makes less noise during operation and is ideal for picking up hair from carpeted floors. - The spiral combo brush is considered the gold standard for pet hair and dirt pick-up on floors of all types. Combined with Neato's powerful vacuum suction, it removes easily debris, dirt and fibers. It is effortless to remove and maintain, it generates reduced noise, and is the preferred brush solution for homes with different floor types. This brush comes only with Botvac D6 and D7 Connected. - The side brush is for thorough edge cleaning. It allows the robot to get deep into corners and right up against walls as well as base boards for superior cleaning coverage. Botvac Connected and Botvac D80 come with a spiral blade brush, a combo brush and a side brush. Botvac D3 Connected comes with a combo brush (no side brush). Botvac D4 Connected comes with a combo brush (no side brush). Botvac D5 Connected comes with a combo brush and a side brush. Botvac D6 Connected comes with a spiral combo brush and a side brush. Botvac D7 Connected comes with a spiral combo brush and a side brush. 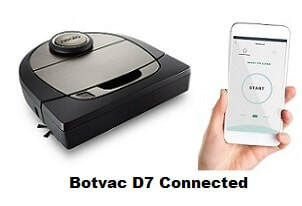 With Botvac D7 Connected, D6 Connected and D4 Connected, you are able to see on your smartphone or tablet a visual map of the space to be cleaned, and you can use the map to set virtual boundaries (called No-Go Lines) to prevent the robot from entering areas that are not supposed to be cleaned. You can also use the visual map to see floor coverage summaries. With the multiple floor plan feature, Botvac D6 Connected and D7 Connected can remember up to three different floor plans. This feature is great for multi-story homes, because you'll be able to set up No-Go Lines on each floor so your robot stays out of trouble everywhere. This feature will soon be available on D5 Connected as well (you will just have to do a software download to your D5 Connected get the new feature). ​This feature will be available later this year and you will be able to download it to your Botvac D7 Connected robot. With zone cleaning, you will b able to target trouble areas in your home more frequently. For example, you will be able to create a "zone" for the dinner table, and send the robot to take care of all those crumbs that fall to the floor. You can schedule all Neato robots to automatically clean at a time convenient to you, up to 7 times a week (one cleaning for every day of the week). With Botvac D80 scheduling needs to be done using the controls on the robot itself as there is no remote-control. With Botvac D3 Connected, D4 Connected, D5 Connected, D6 Connected and D7 Connected, scheduling is done using the App from your smartphone or tablet. With Botvac Connected scheduling can be done both on the robot itself or using the App from your smartphone or tablet. 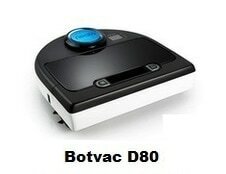 With Botvac D80, spot clean is invoked by pressing the "Spot Clean" button on the robot itself. 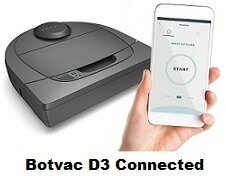 With Botvac D3 Connected, D4 Connected, D5 Connected, D6 Connected and D7 Connected, spot clean is invoked either by pressing the "Start" button twice on the robot, or by using the App from your smartphone or tablet. With Botvac Connected, spot clean can be invoked both on the robot itself by pressing the "Spot Clean" button, or remotely using the App from your smartphone or tablet. With all Botvac robots, when the robot needs more power, it automatically returns to recharge, then returns by itself to where it left off and finishes the job. One cleaning cycle includes up to 3 cleaning runs with 2 recharges of the battery. If no boundary markers are used at room entrances to prevent the robot from entering, these robots will clean one room after another until the entire level is cleaned. Neato robots come with either "standard", "high performance” or "ultra performance" filters. All these filters are designed to capture from the air allergens and dust particles, but clearly, the ultra performance filters are the most powerful and can capture up to 99% of tiny dust mites and allergens as small as 10 microns. All filters are easy to change: just pop out and replace. Botvac D80 and Botvac Connected: The control panel of these robots have a tiny LCD screen and associated touch control buttons that give access to a menu that can be used, among other things, to configure the robot for scheduled cleaning. The screen also displays status indications such as scheduled time, battery level, etc. These robots are also equipped with a "Clean House/Power" button and a separate "Spot Clean" button. The "Clean House/Power" button is used to activate the robot and start a regular cleaning cycle, while the "Spot Clean" button is used to force the robot to vacuum within a limited (4 ' x 6’) space for a more thorough cleaning. Botvac D7 Connected in Action! To prevent the robot from entering off-limits areas, all Neato robots can use Boundary Markers made of magnetic strips. They simply block the robot from moving from one room or area to another. Easily cut, the magnetic strip can fit doorways, around pet bowls, cords, or anywhere you don’t want the robot to go. All Neato robots are compatible with Boundary Markers, and if needed additional Boundary Marker rolls can be bought separately if needed (see below Amazon products section). With Botvac D4 Connected, D6 Connected and D7 Connected, to prevent the robot from entering certain rooms or areas that are not supposed to be cleaned, you can also create virtual boundaries using the App and the visual map. These virtual boundaries are called No-Go Lines. This feature will soon be available on D3 Connected and D5 Connected as well (you will just have to do a software download to your robot to get the new feature). Botvac D80 does not ha tove a remote-control device and does not support Wi-Fi. Therefore, all commands are invoked directly from the control panel on the robot. For all the other Botvac robots, you can use your smartphone or tablet to control the robot remotely. You just need to download the free Neato App to your smartphone or tablet and connect to the robot via Wi-Fi. Note that for all robots the specified run times can vary depending on the amount of work the robot has to do to clean the floors. That is because different types of carpets, different floor plans and different amounts of dirt may require different amounts of effort from the robot and hence different amounts of ''juice'' from the battery. All Neato Botvac robots, except for Botvac D80, come with a Lithium-Ion battery. Botvac D80 comes with a Ni-MH battery. ​When the batteries run low, these robots go back to docking base to recharge and then ​resume the cleaning where it was interrupted. Botvac Connected, Botvac D3 Connected, Botvac D4 Connected, Botvac D5 Connected, Botvac D5 Connected and Botvac D7 Connected are all compatible with Amazon Alexa, so they can all be voice controlled. Just speak to Alexa and ask your Neato to start, and instantly hear it begin to clean. You can also control these six Wi-Fi supporting robots with Apple Watch, Google Home, IFTT or Neato Chatbot for Facebook. Except for Botvac D3 Connected and D4 Connected, all Botvac robots are equipped with a side brush. Botvac Connected, D3 Connected, D4 Connected, D5 Connected, D6 Connected and Botvac D7 Connected all support Wi-Fi and can be controlled from your smartphone. Botvac D80 needs to be controlled from the robot itself using the screen and control buttons the robot is equipped with. Botvac Connected can both be controlled from the robot itself or remotely using your smartphone. 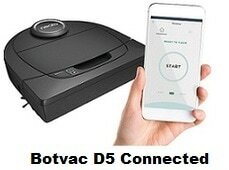 Botvac D7 Connected, D6 Connected, D5 Connected and Botvac Connected are equipped with ultra high performance filters that capture twice the amount of allergens and dust captured by high performance filters. All Neato Botvac robots, except for Botvac D80, come with a Lithium-Ion battery. Botvac D80 comes with an Ni-MH battery. Botvac Connected, D4 Connected, D6 Connected and D7 Connected can be invoked in two different modes: Eco and Turbo. In Eco mode, which is the economy mode, the robot executes a longer and quieter clean, while in Turbo mode it delivers a super-powerful clean (50% more powerful than in Eco mode). With Botvac D4 Connected, D6 Connected and D7 Connected, you don't have to use Boundary Markers to prevent the robot from entering areas that are not supposed to be cleaned. Instead, you can simply set virtual boundaries called No-Go Lines using the App and the visual map of the space to be cleaned. No that this feature will soon be available on D3 Connected and D5 Connected as well. When it will be available, you will be able to download it to your robot. 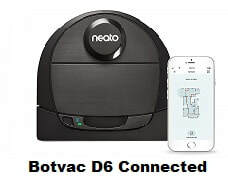 In conclusion, Botvac D7 Connected is Neato's top robot, offering all the features you will ever need for easy, efficient and thorough cleaning of your home. 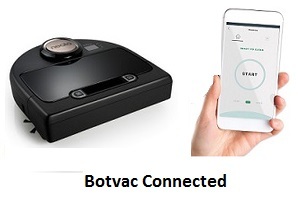 But if you don't need all the above listed features that come with Botvac D7 Connected, you will be more than happy with any of the Botvac Connected series robots. However, if you don't need a smartphone controllable robot, but still want to get the best available non-Wi-Fi Neato, you might want to consider Botvac D80. Please click the Neato Botvac robot of your choice below for price information or to purchase. Note that if some prices are not shown on the Amazon link images below, they will be provided once you click the images. 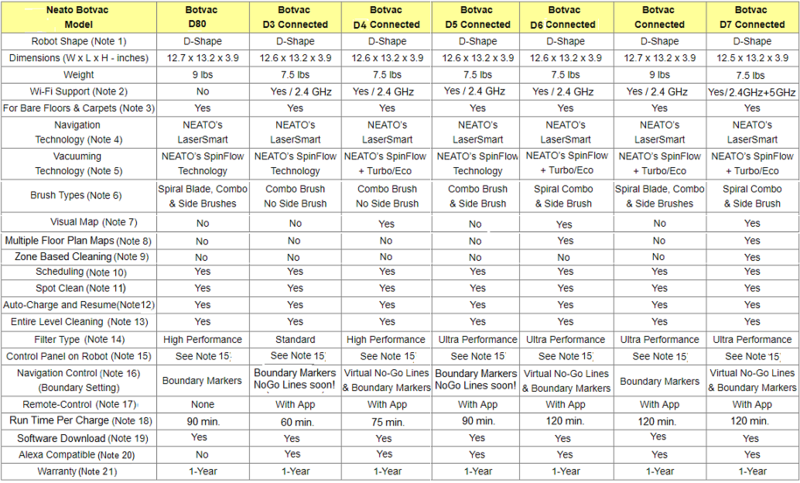 There are two additional Neato Botvac robots, the Botvac D79 and the Botvac D85 which were not included to the above comparison table. That is because Botvac D79 is identical to Botvac D80, except that it does not come with a blade brush and comes only with the combo brush. And Botvac D85 is identical to Botvac D80, except that it comes with two extra replacement filters.